Coach Pete Carroll said Prosise (abdomen) is making good progress in his recovery from December surgery and should have a chance to fill Mike Davis' old role, Bob Condotta of The Seattle Times reports. Coach Pete Carroll expects Prosise (abdomen) to be fully healthy by the start of Seattle's offseason training program April 15, Bob Condotta of The Seattle Times reports. "C.J. really needed the surgery that he had," Carroll said. "It was a little more extended than we thought, but he'll be back from that. That's about an eight-week recovery or something like that so he'll be fine." Analysis: Prosise has appeared in16 of a possible 48 regular-season games since the Seahawks tabbed him with a third-round draft selection in 2016. While the Seahawks haven't completely given up on him, it's possible Prosise could face an uphill battle for a roster spot in 2019 given his lack of reliability. A former wide receiver, the hope is that Prosise can be effectively utilized as a receiving option out of the backfield who could complement a lead runner like Chris Carson or Rashaad Penny. Coach Pete Carroll said Prosise is slated for abdominal surgery, Bob Condotta of The Seattle Times reports. Prosise (abdomen) was placed on injured reserve Saturday, Curtis Crabtree of Sports Radio 950 KJR Seattle reports. Prosise (abdomen), who has been ruled out for Sunday's game against the 49ers, doesn't have a clear timetable for a return and could be a candidate for injured reserve, Bob Condotta of The Seattle Times reports. Prosise (abdomen) has been ruled out for Sunday's game against the 49ers, Curtis Crabtree of Sports Radio 950 KJR Seattle reports. Analysis: Prosise was added to Thursday's injury report with an abdomen issue and didn't make enough progress Friday to avoid a third straight absence. With the Seahawks activating pass-catching back J.D. McKissic (foot) from injured reserve earlier this week, Prosise's time with Seattle could soon come to an end if he isn't shuttled to injured reserve. Prosise (abdomen) didn't practice Thursday, John Boyle of the Seahawks' official site reports. Analysis: All was well with Prosise on Wednesday, so his addition to the injury report one day later doesn't bode well for his Week 13 availability. Also hurting his cause on that front was the activation of J.D. McKissic from injured reserve Wednesday. Even if Prosise gets a clean bill of health, he's a candidate to be a regular inactive for the remainder of the season, barring injuries to other members of the backfield. Prosise is a coach's decision inactive for Sunday's game against Carolina. Analysis: Prosise has hardly played this year, rushing the ball one time for a three-yard loss. He appears to be the fourth option at running back in Seattle behind Chris Carson, Mike Davis, and Rashaad Penny, and he could fall even further if J.D. McKissic (foot) is activated off IR. Prosise has no clear path to fantasy value this season outside of a rash of injuries to the Seahawks' running backs. Prosise could be at risk of losing his spot on the Seahawks' 53-man roster after coach Pete Carroll named fellow running back J.D. McKissic (foot) a candidate to return from injured reserve ahead of the Week 12 matchup with the Panthers, Bob Condotta of The Seattle Times reports. Prosise (coach's decision) is listed as inactive Thursday against the Packers. Analysis: With Chris Carson ready to retake the starting running back role, Prosise will revert to a healthy scratch for the fifth time in nine games this season. As long as the trio of Carson, Mike Davis and Rashaad Penny stay healthy, Prosise is destined to be in street clothes on gameday. Prosise rushed once for minus-3 yards in Sunday's 36-31 loss to the Rams. Analysis: It marked Prosise's only carry in five games, and it was forgettable. Prosise won't see much more work this year behind Chris Carson (hip), Rashaad Penny and Mike Davis. Prosise is inactive for Sunday's game against the Chargers due to a coach's decision. Analysis: Prosise has been reduced to a bench role this season following the emergence of Chris Carson as the lead back. Buried on the depth chart, Prosise is unlikely to be a fixture of the Seattle offense moving forward. Prosise logged zero offensive snaps in Sunday's 28-14 win over the Lions. Analysis: The Seahawks have shown a commitment to run the football, but in Prosise's return from two straight healthy scratches, he wasn't part of those plans. Chris Carson and Mike Davis have dominated the snaps lately, and even rookie first-round pick Rashaad Penny was dropped from the offensive rotation Week 8 as well. Prosise is active for Sunday's game versus the Lions, John Boyle of the Seahawks' official site reports. Analysis: Prosise has just three games of work, logging zero rushes and three catches for 22 yards. It's a crowded backfield with Chris Carson, Rashaad Penny and Mike Davis all getting in the mix, so Prosise shouldn't be counted on to be more than a change-of-pace back. Prosise (coach's decision) is listed as inactive for Sunday's game against the Raiders. Analysis: Prosise is a healthy scratch for a second consecutive week, as the trio of Chris Carson, Mike Davis and Rashaad Penny split work out of the Seahawks' backfield. Prosise has yet to log a single carry in three appearances this season. 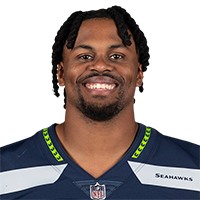 Prosise (coach's decision) is inactive for Sunday's game against the Rams, Gregg Bell of The Tacoma News Tribune reports. Analysis: The 2016 third-rounder has logged three catches for 22 yards in three games to date, but he's yet to record a carry in that span. He's clearly off the fantasy radar for now. Prosise (abdomen) had no touches in Sunday's 20-17 win over the Cardinals. Analysis: Prosise was surprisingly active after receiving a doubtful designation for the game, but the Seahawks left the backfield duties in Mike Davis and Rashaad Penny's hands. In fact, Prosise has zero carries and just three catches for 22 yards through three contests this year. Prosise (abdomen) is listed as active Sunday in Arizona. Analysis: The Seahawks pulled off quite the trick Week 4, keeping the player doubtful to suit up (Prosise) active while deactivating the questionable candidate (Chris Carson - hip). Prosise likely won't factor into much more than obvious passing downs behind lead back (and rookie) Rashaad Penny. Prosise (abdomen) is listed as doubtful for Sunday's game against the Caridnals, Gregg Bell of The Tacoma News Tribune reports. Analysis: Prosise will miss his second consecutive game of the regular season due to an abdomen injury. Chris Carson (hip) and Rashaad Penny stand to once again share backfield touches, and Prosise faces an uphill battle to get healthy and carve out a third down role in Seattle's offense. Prosise (abdomen) didn't participate in Wednesday's practice, John Boyle of the Seahawks' official site reports. Coach Pete Carroll said Prosise (groin) is also dealing with a core-muscle injury, Curtis Crabtree of Sports Radio 950 KJR Seattle reports. Analysis: Prosise was listed as inactive for last week's game against the Cowboys with only the groin issue. Now that he has another injury to worry about, Prosise faces an even more difficult battle to return to action Week 4 against the Cardinals. The potential exists for Prosise to fill a vital role in Seattle's passing game, but his career-long health problems have prevented him from getting major traction on offense. General manager John Schneider said Prosise is inactive Sunday against the Cowboys due to "a little bit of a groin" injury, Bob Condotta of The Seattle Times reports. Analysis: Included on the Seahawks' injury report Friday, Prosise practiced in full with what has deemed an abdominal injury. The groin is similarly in the midsection of the body, so perhaps the training staff honed in on the true nature of the injury the past two days. With Prosise out of the lineup, the backfield will be powered by Rashaad Penny and Chris Carson. Meanwhile, Mike Davis will be available for any reps that remain. 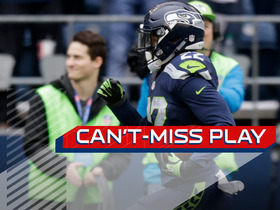 Prosise could line up at receiver and see an increased role in Seattle's passing game with Doug Baldwin (knee) expected to miss multiple weeks, Andy Patton of USA Today reports. Prosise didn't have any carries or targets during Sunday's 27-24 loss to the Broncos. Analysis: With Mike Davis (coach's decision) inactive, it appeared Prosise might have an opportunity to see some work. However, Chris Carson and Rashaad Penny combined for 14 carries and 10 targets, while Prosise logged just seven snaps on offense and 17 on special teams. Prosise may have a role in Sunday's game at Denver, Andy Patton of the Associated Press reports. Prosise should be assured of a roster spot after J.D. McKissic suffered a Jones fracture in his foot, Bob Condotta of The Seattle Times reports. Analysis: Prosise already seemed to have the edge over McKissic for a pass-catching role out of the backfield. This injury leaves no doubt about the winner of the competition, as McKissic is expected to be out for 4-to-6 weeks. The Seahawks may want to bring in some insurance, considering the oft-injured Prosise has missed 21 games in two NFL seasons. He did look sharp in Saturday's preseason loss to the Chargers, taking three carries for 12 yards and catching all six of his targets for 35 yards. 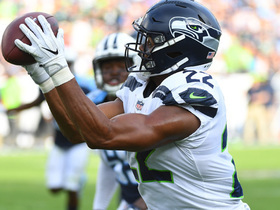 Prosise (hip) rushed three times for 12 yards and caught all six targets for 35 yards in the Seahawks' 24-14 preseason loss to the Chargers on Saturday. Analysis: The biggest thing for Prosise is staying healthy. He didn't do much with his nine touches, but at least he didn't get hurt. If he makes it through camp without any more injuries, he'll make the team, as the Seahawks still believe in his upside. More injuries and missed time, though, and it wouldn't be surprising if Seattle finally gives up on him. Seahawks coach Pete Carroll said Prosise (hip) will play in Saturday's game against the Chargers, Gregg Bell of The Tacoma News Tribune reports. Analysis: Prosise returned to practice Wednesday with some limitations and was cleared for full-team drills Thursday. The progress puts him on track for Saturday, though his extensive history of injury setbacks means it won't be a sure thing until he actually takes a snaps. Prosise and J.D. McKissic are competing for a pass-catching role, with the loser in danger of missing out on the 53-man roster. Prosise (hip) appeared to handle most of the running back reps at Thursday's practice, Bob Condotta of The Seattle Times reports. Prosise (hip) was only a partial participant in Wednesday's practice, Gregg Bell of The Tacoma News Tribune reports. Prosise (hip) returned to practice Wednesday, Bob Condotta of The Seattle Times reports. Coach Pete Carroll considers Prosise "day-to-day" with his hip injury, Gregg Bell of The Tacoma News Tribune reports. Analysis: Prosise was held out of Thursday's preseason opener against the Colts due to a hip flexor that plagued him in practice last week. The injury is yet another in a line of issues that have hindered him during two pro campaigns, as he's been able to suit up only 11 times to date. 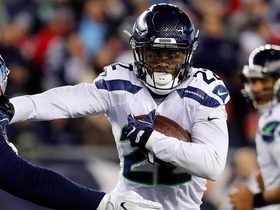 The fact he remains on his rookie deal indicates a roster spot is all but assured, but Prosise may have a difficult time wresting reps from 2018 first-round pick Rashaad Penny and second-year back Chris Carson. Prosise missed Thursday's preseason loss to the Colts due to a hip injury, the Seattle Times reports. "Hip flexor just kind of acted up right at the middle/end of that last practice so we just kept him out of there," said head coach Pete Carroll. Analysis: While Carroll described the injury as minor, any issue is a worry for Prosise, who has played just 11 of 32 possible regular-season games in his first two seasons. Prosise is off to a strong start at training camp, getting most of the first-team snaps in the two-minute offense, Bob Condotta of The Seattle Times reports. Analysis: Chris Carson and Rashaad Penny are rightfully getting most of the attention with their battle for the starting job, but the Seahawks also need to decide which of their running backs will handle passing downs. While an obvious fit in terms of skillset, Prosise has played just 11 games in two seasons and hasn't done much of note since Week 11 of 2016. The team could turn to scatback J.D. McKissic if Prosise once again proves incapable of staying healthy. Prosise (ankle) was pushed further down the Seahawks' depth chart with the selection of Rashaad Penny in the first round of the 2018 NFL Draft, Bob Condotta of The Seattle Times reports. 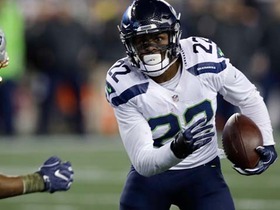 Seahawks general manager John Schneider recently suggested Prosise (ankle) is still a part of the team's plans, John Boyle of the Seahawks' official website reports. "Look, we need C.J. (Prosise) to be a reliable dude," Schneider said. "He's an extremely talented guy." Prosise (ankle) figures to be out for about six weeks but could return for the end of the season, according to head coach Pete Carroll, Curtis Crabtree of Sports Radio KJR reports. Analysis: Prosise was placed on injured reserve Tuesday after spraining his ankle last week against the Cardinals. Carroll said it could come down to a race between Prosise and Chris Carson (ankle) to receive one of the Seahawks' "designated for return" tags. Both backs have landed on injured reserve and are believed to be able to return in late December. The Seahawks signed Mike Davis back from the practice squad to take Prosise's spot on the active roster. The Seahawks placed Prosise (ankle) on injured reserve Tuesday, Curtis Crabtree of Sports Radio 950 KJR Seattle reports. Coach Pete Carroll reported that Prosise suffered a sprained ankle in Thursday's win over the Cardinals, Curtis Crabtree of Sports Radio 950 KJR Seattle reports. Analysis: Prosise rolled his ankle in the third quarter and was ruled out for the remainder of the game shortly thereafter. Carroll added that the ankle sprain is not on the same ankle that had been bothering the running back over the past few weeks. He currently appears to be very much questionable for the team's upcoming Monday night contest against the Falcons. 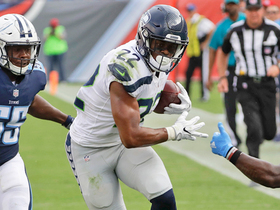 Prosise will not return to Thursday's game against the Cardinals after suffering an ankle injury, John Boyle of the Seahawks' official site reports. Analysis: Prosise went down in the third quarter of Thursday's contest. He had compiled three yards on three carries in just his second time in the lineup since Week 3. Thomas Rawls figures to continue doing the heavy lifting in the Seahawks' backfield going forward. The severity of the injury is not known at this time. Prosise is active for Thursday's game at Arizona. Analysis: As expected, Prosise will return to the lineup for just the second time since Week 3. The state of the Seahawks' backfield is in some flux due to the absence of Eddie Lacy (groin), While Thomas Rawls is expected to lead the way, there should be room for Prosise to contribute to what has so far been the 19th-ranked offense on the ground this season. Prosise (ankle) put in a full walk-through Monday, John Boyle of the Seahawks' official site reports. According to John Boyle of the Seahawks' official site, head coach Pete Carroll told 710 ESPN Seattle on Monday that Prosise (ankle) is "ready to play. He'll play" Thursday at Arizona. Prosise (ankle) is inactive for Sunday's game against Washington. Analysis: Prosise seemed to be on the verge of a return to action Sunday, but he'll now look to do that in this coming Thursday's game against the Cardinals. Eddie Lacy, Thomas Rawls and J.D. McKissic with thus head the Seahawks' Week 9 backfield. Prosise (ankle) is questionable for Sunday's game against the Redskins, with Seahawks head coach Pete Carroll labeling the running back a game-time decision, Curtis Crabtree of Sports Radio 950 KJR Seattle reports. Prosise's (ankle) status for Sunday's game against the Redskins could be decided in the hours leading up to the 4:05 p.m. EDT kickoff, Lindsey Wisniewski of USA Today reports. "We'll see all the way to game time about C.J.," Seahawks head coach Pete Carroll said Friday. Analysis: Prosise was limited during the Seahawks' first two practices of the week and is expected to carry a questionable designation heading into the weekend. The running back has been dealing with a high-ankle sprain since Sept. 24, playing just two offensive snaps over the Seahawks' last four games while sitting out three contests entirely. Prosise's absences have opened the door for J.D. McKissic to earn more opportunities as a pass catcher out of the backfield. Prosise (ankle) returned to a limited practice Wednesday, John Boyle of the Seahawks' official site reports. Analysis: Prosise at least took a small step forward after sitting out practice entirely all last week. The Seahawks would presumably like to see him log a full practice before activating him for Sunday's game against the Redskins. Should Prosise miss another game, J.D. McKissic would continue filling in on passing downs. 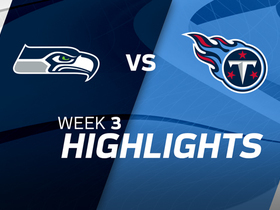 Check out highlights from the Seattle Seahawks vs. Tennessee Titans Week 3 matchup. 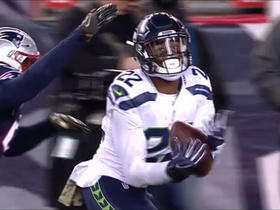 Seattle Seahawks quarterback Russell Wilson completes last-minute shuttle pass to running back C.J. Prosise for an 11-yard gain. Seattle Seahawks running back C.J. Prosise makes leaping catch for a 46-yard gain. 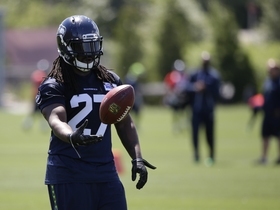 NFL Network's Mike Garafolo talks about the chemistry between the Seahawks running backs. 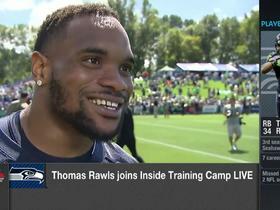 Thomas Rawls joins "Inside Training Camp Live". Seattle Seahawks running back C.J. Prosise bursts through a hole for a 72-yard touchdown. NFL Media's James Palmer talks about Seattle Seahawks running back Thomas Rawls' health and C.J. Prosise's role in the offense. 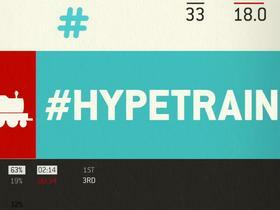 Maurice Jones Drew and Adam Rank tell you which Fantasy studs you need to get hyped about moving forward. Seattle Seahawks QB Russell Wilson finds running back C.J. Prosise between two defenders for 38 yards. Seattle Seahawks running back C.J. Prosise finds the hole on a 10-yard run.